Please join the US-China Business Council (USCBC) and experts from the business, academic, and policymaking sectors for an overview of the latest economic trends in China and important issues in US-China commercial policy. Featuring Keynote Remarks by the Honorable Kevin Rudd, President, Asia Society Policy Institute, and Australia's 26th Prime Minister and 2010-2012 Foreign Minister. Cancellations for refunds must be received in writing by 5:00 pm ET, Tuesday, May 29, 2018. No-shows will be billed. 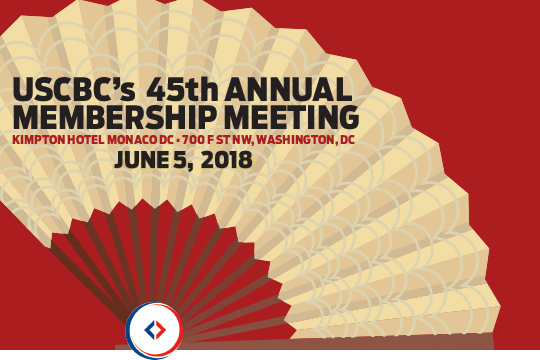 Tariffs and trade deals are still uncertain, but China’s government restructuring is likely to be the most significant long-term outcome this year, said speakers at USCBC’s 45th Annual Membership Meeting June 5. Members from a wide range of companies joined USCBC staff and guest speakers to discuss changes in the Chinese business environment and the US-China relationship at this important time for trade. Keynote speaker Kevin Rudd, former Prime Minister of Australia and President of Asia Society, outlined high-level priorities for the United States in the world and its relationship with Asia, setting the tone for the importance of the US-China relationship at this pivotal moment. José Viñals, Group Chairman of Standard Chartered, discussed the unique aspects of the financial sector in business with China, and gave members his perspective on the Belt and Road and the role that global financing can play. The meeting’s morning panel covered domestic politics, with an explanation of the key changes resulting from China’s government reshuffle this year and the expanded authority of President Xi from Clemson University’s Dr. Xiaobo Hu and Jude Blanchette of Crumpton Group. Owen Haacke, head of USCBC’s Shanghai office, updated members on the operating environment in China from an on-the-ground perspective, with Bliss Khaw from Control Risks advising members on key business issues they may face and best practices to deal with them. The afternoon wrapped up with a panel of government speakers, with members hearing from Greg Walters, Assistant US Trade Representative for Intergovernmental Affairs and Public Engagement, and Jason Hafemeister, Trade Policy Coordinator at the US Department of Agriculture. The two covered the Section 301 investigation and updates on tariffs as well as Commerce Secretary Ross’ recent China trip and agriculture and energy deals discussed there. USCBC members may access reports and speaker presentations here.